This article is from about a year ago but not much has changed! 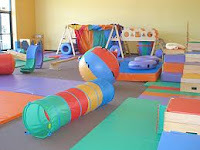 My daughter still LOVES Gymboree and has learned a lot during the past 6 months we've been going there. It has taught her to share with other kids, say please, thank you and sorry when it's called for, sit for listening time with the teacher and so much more! I highly recommend it for your little ones. Well, I'm not exaggerating when I say that it's been AT LEAST a year since I've been meaning to take Shae to a Gymboree class!! Since she was about 7 months old, I've wanted to take her but just couldn't find enough time in the day. Between work, cleaning, cooking, making lunches, doing laundry....and getting up for work before 4 am during the week, I was just too tired and didn't have the energy to do it. I was also under the impression that classes were only in the mornings.... more suitable for the stay at home mom schedule. Well, this week, after getting my 20th coupon in the mail for a free introductory class, I finally logged onto the website from my cell phone (or smart phone as some would call it) and signed Shae up for her first class. The class was scheduled for Wednesday at 7:10 pm. So, my daughter, husband and I had dinner, changed and got ready to go. Although we only live 1.2 miles away, we left 25 minutes prior to the time the class would start......I guess we were just a little bit anxious. We got there within a few minutes, of course, and got out of the car. We peeked in the window, saw that another class was still in session, and decided to take a walk around the block while we killed time before our class was to begin. Now, back to the Gymboree class...Shae was encouraged to go barefoot to prevent slipping and sliding and our little newby didn't even hesitate!! She immediately started climbing the ladders. going through the tunnels, down the slides and on the bouncy balls! As parent newbies, we just stared for a bit and analyzed the crowd. After a few seconds, we got more comfortable, took our shoes off, put the "clean socks" on and followed Shae around. She immediately loved it and climbed all over. She went up the ladders, rolled the balls, climbed on the teeter toter and had a blast. When the class started, teacher Heather, a spunky, sweet, very animated 25 year old, began banging a tamborine and called the kids to the mat. Most, if not all, immediately came and were immediately drawn to Gymbo! A clown, and the Gymboree mascot, for lack of better words. She had a BIG Gymbo and LITTLE Gymbo and, therefore, the lesson of the day was Big and Little. She walked around and showed the kids the big slide and the little slide, big ball and little ball, big ladder and small ladder and so on. She then encouraged us to follow our children around and continue the lesson on our own. We did that and had a blast interacting with Shae, the other parents and the other kids. Throughout the class, teacher Heather called the kids back to the mat, added more to the lesson with big and small rings, bubbles and more. 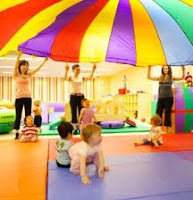 We culminated by playing parachute and Shae then continued to play. Signing up for the class weekly was a no brainer. It was obvious it would benefit her socially, physically and mentally. It would help get her in the classroom mentality, needing to stay in a group for periods at a time and it would get her around other kids, something we don't do unless we go to the mall germ pits (aka indoor playgrounds at malls). In addition to the weekly Play and Learn class, we also get free access to their Open Gym Time that's scheduled various times and days throughout the week. That alone makes it worth it because it gives Shae other opportunities to come play with other kids without the structure of the class. Overall, my only regret is not signing up for the class sooner! I know for a fact that Shae would have benefited greatly had she been attending from an early age. If and when I have another baby, I'll be coming as soon as possible and, since classes start for the 0 - 3 month age group, that means it'll be almost immediately! Hope you have all enjoyed my review and I welcome you to attend, at least, the free introductory class. You have absolutely nothing to lose and much to gain! Visit Gymboree 's website for locations near you !